Can Cats Eat Eggs & Yolks? Left Raw? Cooked Scrambled? Hard Boiled? When you scrape your brain for foods that would probably be safe to feed a cat, the list of those that immediately come to mind probably goes something like this: fish, meat, eggs… and then there’s likely to be a bit of hang up and a ponder. But while the first two options are obviously alright in most cases – is the same true about eggs? Can cats really eat eggs safely? And does that include egg white only, or egg yolks as well? Are they fine to be eaten raw? What about cooked: scrambled, hard boiled, or in an omelette? Is it healthier to feed cats eggs that are prepared a specific way? Are there potentially health benefits to feeding your cat eggs? And how much egg is altogether too much egg? How much is definitely within the realm of safe and healthy? I’ll do my best to answer all the egg-cellent egg related questions you can think up below! Cats absolutely can eat eggs. And unlike peanuts and peanut butter, which are fine to feed a cat but don’t have much of an upside, eggs, like feeding your cat lettuce as a snack, have considerable benefit. Actually, eggs are quite healthy for cats to eat as a snack. Obviously, there are caveats and tonnes of questions beside this base-level yes or no, however, so let’s get into those one by one. Why are eggs healthy for cats? Can cats live off of egg? No, cats cannot live off of eggs alone. While eggs do provide one heck of a lot of valuable nutrients to cats, they absolutely do not contain all the nutrients a cat needs to maintain a balanced diet. So, I’m very sorry to say – no vegetarian kitty possibilities here. You’ll end up with a sick kitty on an egg-only diet. But as a part of an overall, balanced diet, as a snack accompanying a nutritious cat food, they’re A+ options to consider. Is it dangerous for cats to eat egg yolks? Absolutely not. We’ve all heard about the dangers of egg yolks for the human heart before – egg yolks contain a lot of cholesterol that in high portions may contribute to human heart disease. That being said, the type of heart disease that humans can get from cholesterol, called atherosclerosis, is not a form cats typically suffer from. 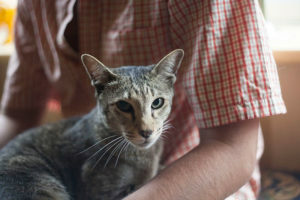 Cats do suffer from heart disease, but they generally do not suffer from atherosclerosis (which, in humans, was the source of the anti-cholesterol craze). 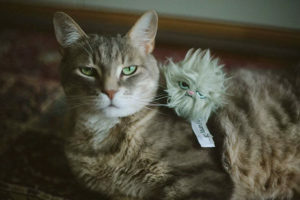 There are two main types of heart disease in cats. One, hypertrophic cardiomyopathy, is largely hereditary and not linked to lifestyle (although feline obesity exacerbates it). The other, dilated cardiomyopathy, is linked to dietary taurine insufficiency. This condition has been almost completely eliminated by taurine supplementation in cat foods. Oh, by the way: Eggs are a wonderful source of taurine. So one point for egg yolks and, thanks to being an egg-cellent source of taurine, yet another point for eggs! Remember the amino acid taurine from somewhere? The lack of it in dog food is one of the reasons cats can eat dog food as a snack, but not safely as a main meal. Is it ever dangerous for cats to eat eggs? 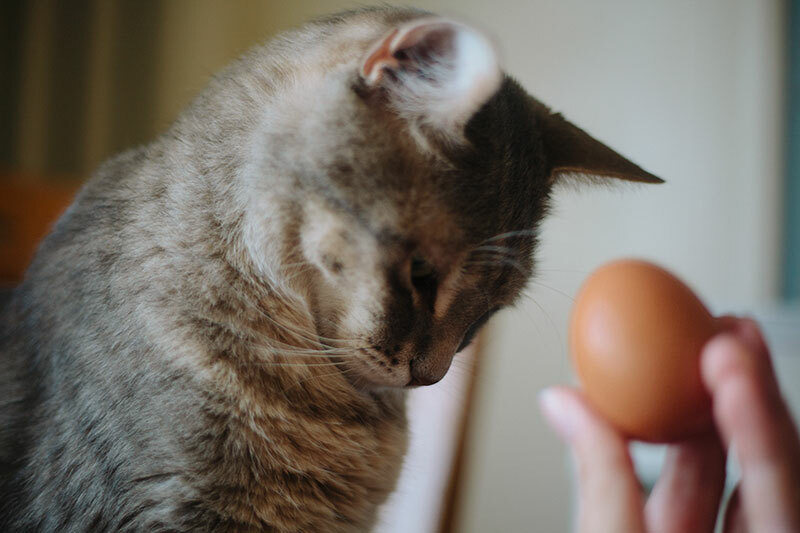 If your cat has an egg allergy, it’s dangerous for your cat to eat eggs. But egg allergies in cats are not at all common, so it’s more likely perfectly safe for your cat to eat. How much egg can cats eat safely? Cats should never have too many snack foods – period. The rule of thumb is to only feed around 10% of your cat’s diet in snacks – which include all foods besides regular cat food combined. Why? Let’s say your cat has a daily recommended calorie count of 200 calories (most cats should be eating around 200-225, so this is pretty accurate). 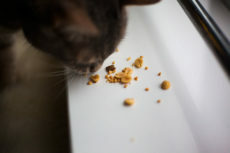 If he or she has 20 calories of snack foods besides regular cat food combined, that leaves 180 calories of cat food a day – enough to make sure your cat eats all the valuable dietary nutrients found in a balanced diet cat food necessary to ensure long-term overall health. Now let’s say the snacks are upped to 40 calories. Either 1. 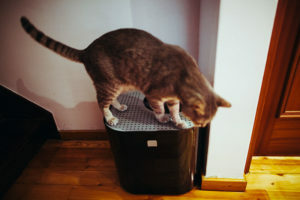 Your cat is now consuming more calories per day than necessary (up to 220 total calories), gaining weight and eventually possibly having issues with obesity, or 2. 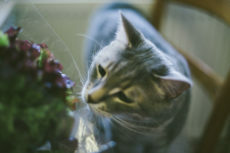 Your cat is consuming less of a balanced diet (down to 160 calories of cat food), which means he or she may not be getting all the valuable nutrients out of the regular cat food necessary for long term health. So stick to around 90% cat food, 10% combined snacks if you’d like to give snacks beside regular cat food. 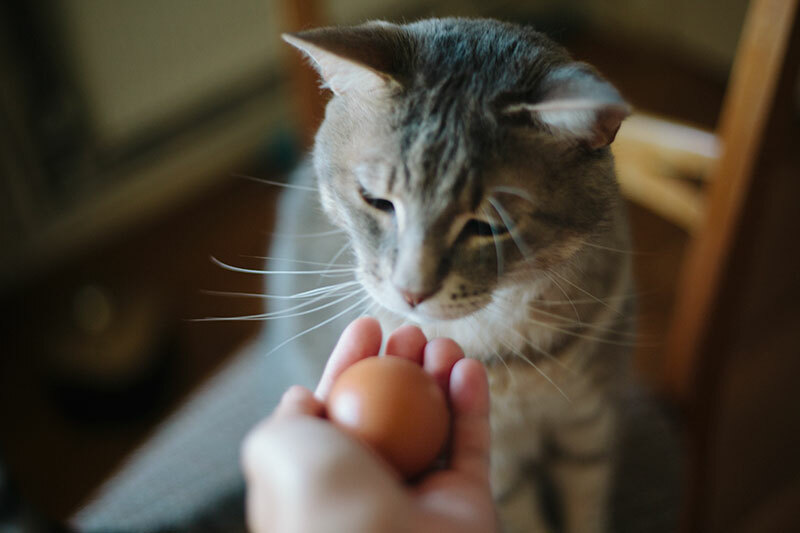 Since the typical egg is around 155 calories, if you only feed your cat eggs as a snack and you want to give him or her a little bit each and every day, you can safely feed your cat around 10-15% of an egg every 24 hours. A whole egg would blow the calorie count out of the water, and so would half an egg. A quarter of an egg should be fine if you happen to be feeding your cat eggs only as a snack, and only every other day. What Form of Eggs Can Cats Eat? Can cats eat eggs cooked by being hard boiled? Scrambled? Cats can absolutely eat eggs that are hard boiled. This is probably the safest and most healthy way to feed cats eggs. They can also eat eggs that are scrambled, since there’s no harm in cats eating olive oil. 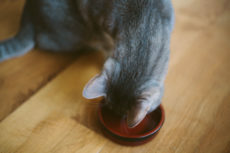 If you’re using another oil, be sure and do a quick check on Google to make sure your cat can eat the type of oil you’re using as an ingredient, though to my knowledge, most cooking oils are safe for cats. 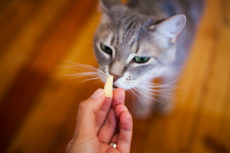 You really have to be careful feeding cats omelettes, as some ingredients that are frequently put into omelettes, like onions for instance, are dangerous for cats and pets in general to ingest. If you make sure that absolutely every ingredient in your omelette is cat-safe, it’s fine to feed your cats a bit of your omelette, but definitely don’t overdo it, as the calories in that omelette are likely way too much for your small pet. 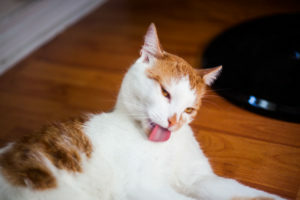 Is it dangerous for cats to eat raw eggs? I’d strongly advise cooking eggs before feeding them to your cats. Consuming raw eggs can lead your cats to contract Salmonella, E. coli, or Campylobacter, and that bacteria can then transfer to you and your family members. 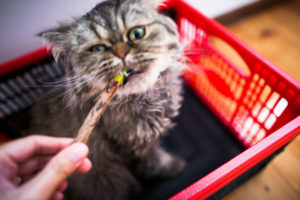 If you’re aware of these risks, however, and happen to be okay with chancing them so long as you can feed your cat a raw diet containing raw eggs, know that there don’t seem to be any other side effects or downsides besides that could harm you or your pet. […] Egg whites also contain a protein called avidin, which binds biotin (also known as vitamin B7). Overconsumption of avidin could cause biotin deficiency. Cooking denatures the avidin. Therefore, it is recommended that cats consume only cooked eggs. But let’s be honest and realistic: A cat would have to eat a LOT of raw egg, probably over a period of months or years, for such a deficiency to develop. Are raw eggs really that bad? Probably not. Thus, if you’re willing to take the risk on the Salmonella/E. coli/Campylobacter front, and you’re not feeding an exceptionally high volume of raw eggs (which could lead to biotin deficiency over months or years), things should be fine. Your Experience with Cats + Eggs? Have you ever fed a cat eggs before? What form were the eggs? Did your cat enjoy them? Ask for more? Do you have some cats that will eat eggs and others who won’t? 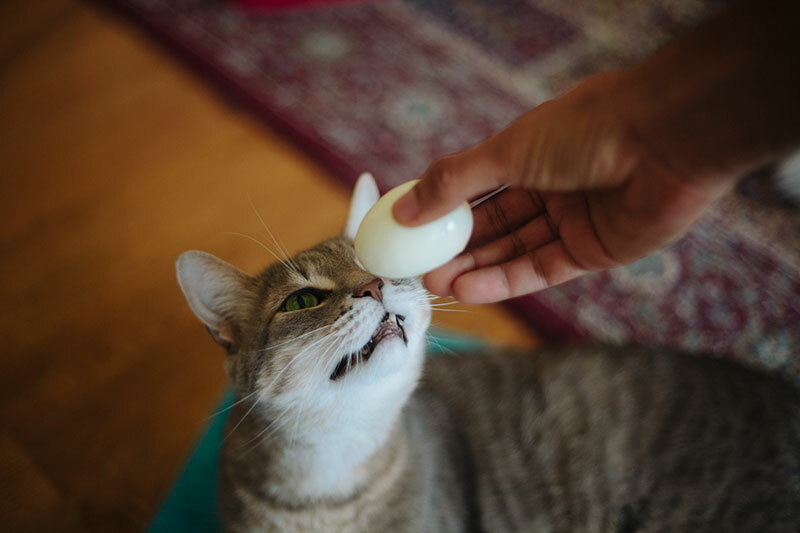 Have you ever considered giving your cat a bit of the egg from your meal before? Considering it now? Let me know what happens if you do give it a try! Personally in our family, my cat Avery won’t touch eggs, while my mother’s cat Walker loves the things! She’ll give him a little bit of her scrambled eggs when she has them for breakfast and he’s happy as a clam. I didn’t know before doing my research for this post they were so incredibly healthy for cats – packed with protein and amino acids, or that they had taurine, but now that I do, maybe I’ll encourage Avery to try a nibble when I have my morning hard boiled egg. Who knows, maybe a sprinkle of catnip seasoning will do the trick and get him to try them out! Can Cats Eat Dog Food? Is It Safe: 1. As a Main Diet? 2. Occasionally? Can Cats Eat Peanuts? 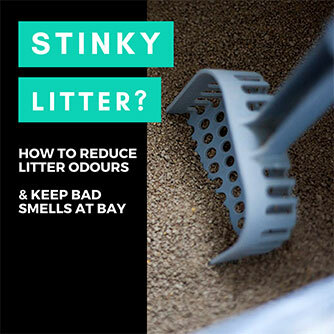 Are They Bad for Cats? Can Cats Be Allergic? Is Wet, Dry, or Raw Cat Food Better for a Cat’s Teeth? 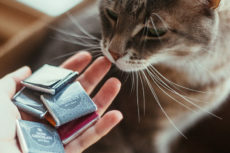 Can Cats Eat Chocolate? Is Chocolate Poisonous to Cats? My Cat Likes Lettuce! Can Cats Eat Lettuce? Is It Safe to Feed to Cats? Cannot say we’ve fed the cats eggs before, but I’m going to put it on the list…that is, if The Hubby is so inclined. He’s the chef; I’m only allowed to ‘visit’ the kitchen…hehehehe! Yeah my husband is the chef of the household, too! 🙂 Let me know if your hubby tries giving the cats any eggs, curious about if they will like them! 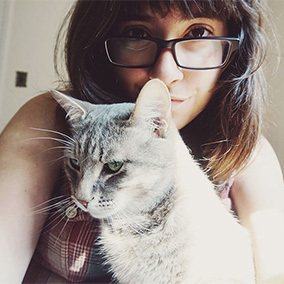 A Few of My Favourite Things About My Pet; What Are Some of Yours?